Duration: 52 min. per ep. Ryoutaro Shiba and his family have just moved into a new housing neighborhood. He soon discovers he is lucky enough to be living next to a beautiful and bewitching girl named Nozomi Egawa. 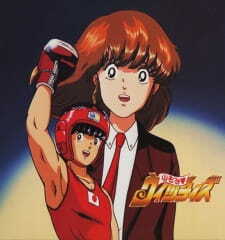 Nozomi is athletic, an actress, and surprisingly more than anything else, she wants Ryoutaro to become a boxer so that he can fulfil her dream. Ryoutaro isn't exactly sure what Nozomi's dream is, but he definitely does not want to become a boxer. Unfortunately for Ryoutaro, he finds himself being dragged to the high school boxing club because Nozomi has written a resume for him claiming that he is a boxing genius! It actually seems that Ryoutaro has a special gift for boxing that he has never known about before. Ryoutaro soon finds himself in the winners' circle. But for how long can he last, and can he really live up to Nozomi's expectations? Put on those boxing gloves, and step into the ring. We're going to take a look at some of the most intense and enjoyable boxing anime and manga in existence. Are you tough enough to handle these knock-out titles?